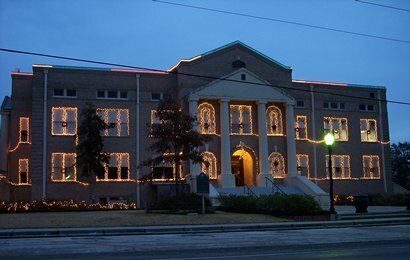 San Jacinto County courthouse, Coldspring, Texas. When San Jacinto County was created in 1870, the county seat of Coldspring (known earlier as Coonskin and Fireman�s Hill) had already been around for over twenty years. The Carnes Hotel was used for court proceedings until a Victorian style two-story wood frame courthouse was completed in 1871. Builders Thomas and Werner from Fort Worth were paid $8,000 for its construction. 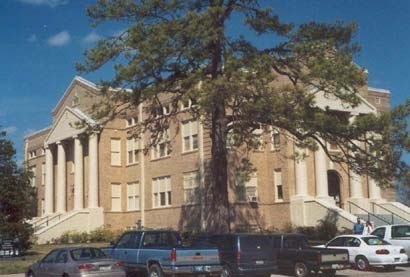 A separate wood frame grand jury building was later built. In 1887, a brick jail was built across from the courthouse. The jail was expanded in 1911 and continued to be used until 1980. In 1895, a one-story brick records vault was built behind the courthouse, similar in architecture to the 1887 jail. This building stood until it was demolished in 1980, but the 1887 jail is still standing. On March 30, 1915, fire destroyed the courthouse and many of the other surrounding buildings, but the county records were saved in the records vault. Unhappy with the town site, the people of Coldspring relocated the town to higher ground, � of a mile southwest of the town�s original location and planning began for the construction of a new courthouse. Architects Roy E. Lane of Waco and Wilkes A. Dowdy of Houston, who were partners for a brief time, were hired to design the new courthouse. (Lane was best known for his partnership with Sanguinet and Staats in the design of Waco�s ALICO building, completed in 1911. Dowdy worked for the Houston office of Sanguinet and Staats and was appointed city architect of Houston in 1921.) The firm of Price & Williams was hired as the contractors, but the county would go through two more contractors before the courthouse was completed. Designed in the Classical Revival style, the courthouse was built with locally fired brick. 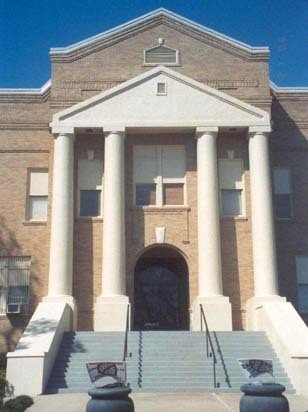 The entrances on each side had large entry stairs and Corinthian columns topped with corbelled brick capitals that reached the roof. A small penthouse was built in the center of the roof (a dome or clock tower was not within the budget) with a glass skylight below it over an interior central rotunda with concentric staircases. The courthouse originally had a jail in the basement with a winding staircase that led to the original location of the witness stand and judge�s bench in the second floor district courtroom. When the courthouse was completed in 1917, the post office relocated there and remained in the courthouse for ten years. By the time the courthouse was finished, most businesses and residences had relocated to the new town site which served to boost the development of the town. In 1937, a WPA improvement plan led to changes in the courthouse�s original exterior architecture. The deteriorating Corinthian columns and corbelled brick capitals were removed and replaced with white Doric columns and pediments. 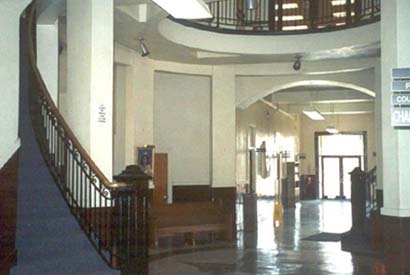 Later renovations in the 1950s and in 1975-76 altered the interior, including the addition of tile floors and wainscoting, the lowering of the interior ceilings to install central heat and air conditioning and new lights and the partitioning of existing offices to create more office space. The original stained glass light in the rotunda was removed in 1990. 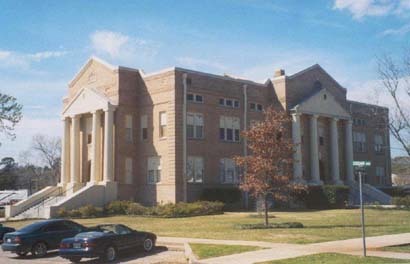 Despite the modifications over the years, the 1917 San Jacinto County courthouse still dominates the town of Coldspring and continues its role as the seat of county government. The historical marker incorrectly lists architect "Dowdy" as "Dabney." 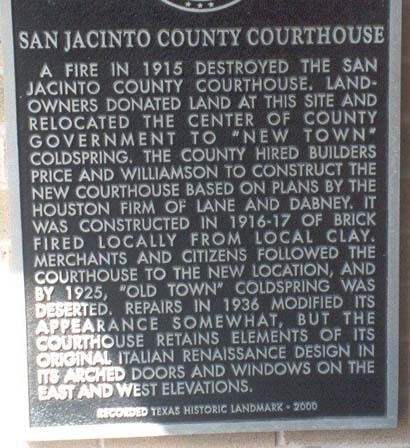 A fire in 1915 destroyed the San Jacinto County courthouse. Landowners donated land at this site and relocated the center of county government to "new town" Coldspring. 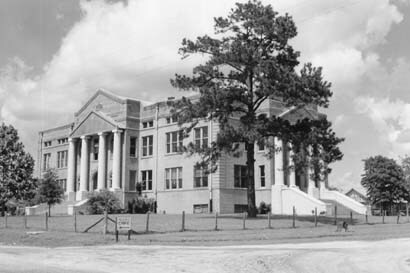 The county hired builders Price and Williamson to construct the new courthouse based on plans by the Houston firm of Lane and Dabney. * It was constructed in 1916-17 of brick fired locally from local clay. 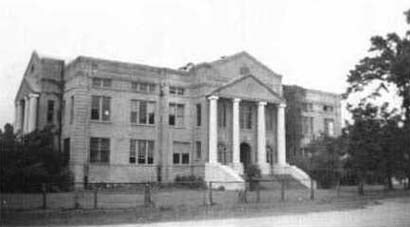 Merchants and citizens followed the courthouse to the new location, and by 1925, "old town" Coldspring was deserted. Repairs in 1936 modified its appearance somewhat, but the courthouse retains elements of its original Italian Renaissance design in its arched doors and windows on the east and west elevations. "West side entrance. The Doric columns and pediment replaced the original Corinthian columns and corbelled brick capitals."